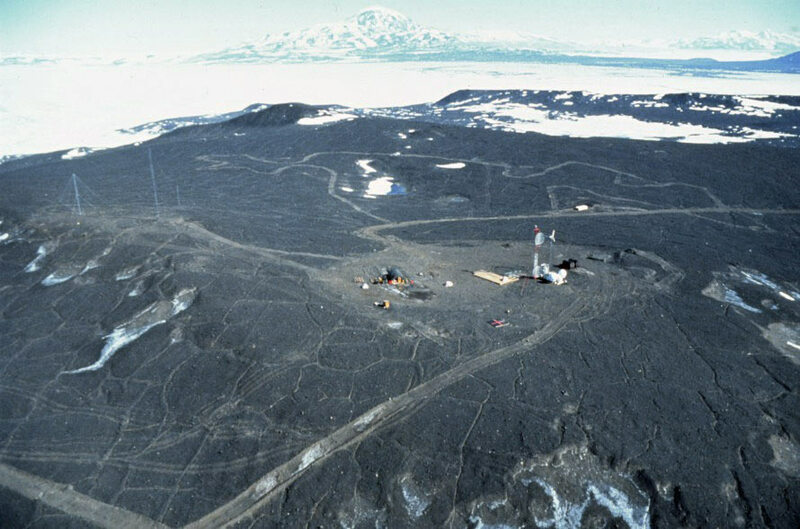 The site for what would eventually become McMurdo Station was selected at the beginning of the twentieth century by that famous British explorer Robert F. Scott. 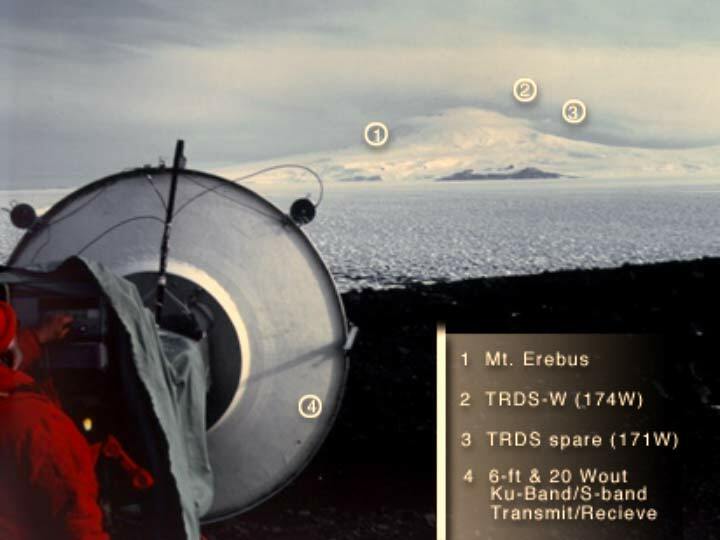 His site survey data came from earlier investigations conducted by James Clark Ross in 1841; Scott's criteria included: furthest southernmost access by sea to the Antarctic; an accessible anchorage with easy access to shore land; abundant wildlife as a food supply for men and animals; and potential access to a surface route to the South Pole. The name he gave to Winter Quarters Bay summarizes the reason for the site selection. 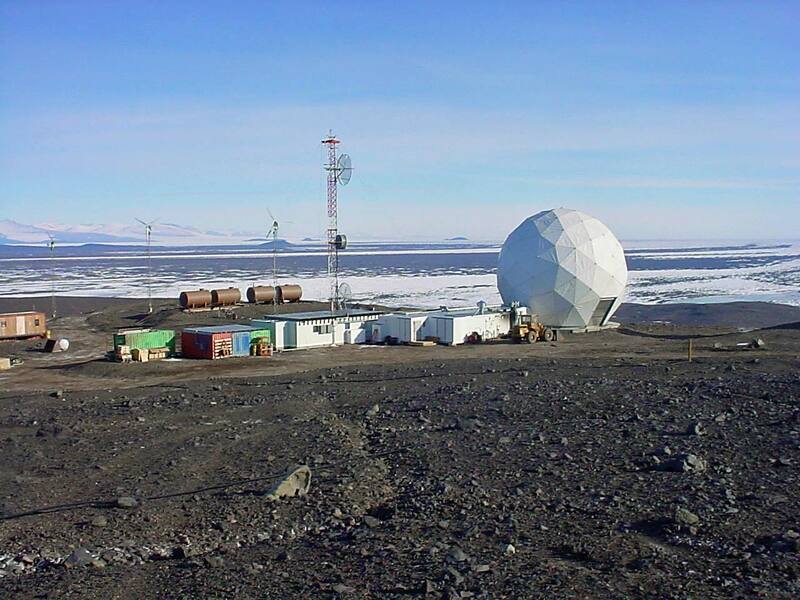 Unfortunately for the present Antarctic program, Scott had no reason to consider the suitability of the site for access to geosynchronous communications satellites...which at the site latitude are only a few degrees above the horizon. Therefore, at this site they are obscured from sight by the most significant feature of Ross Island--Mt. Erebus. 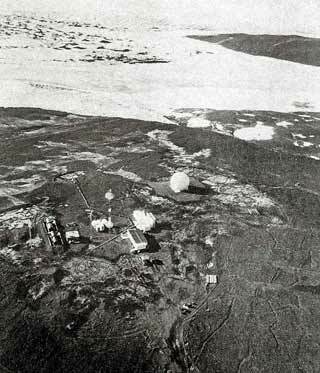 Accordingly, when the need to access such satellites arose in the 1980's, in January 1984 two INMARSAT Standard-A ship earth terminals were completed/commissioned by ITT ANS on Observation Hill near the old nuclear plant site, to access MARISAT F3 (location photo and information). 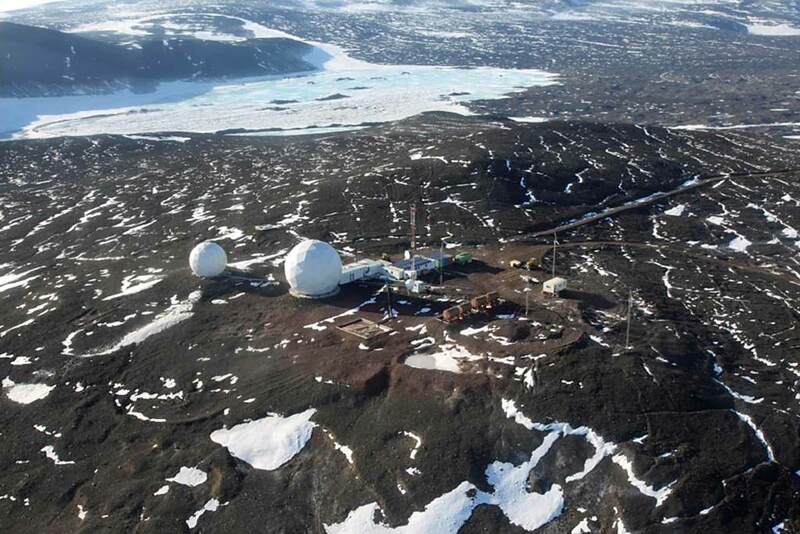 This location proved unsuitable for the long term, as the satellite service was to be changed/relocated so that it would be inaccessible behind Mt. Erebus. A 1984 site survey was conducted by ITT/ANS engineer (and later coworker/friend) Bill Godley. After initial proposals to use Marble Point or the Daily Islands were determined to be unsuitable. the Black Island site was selected. 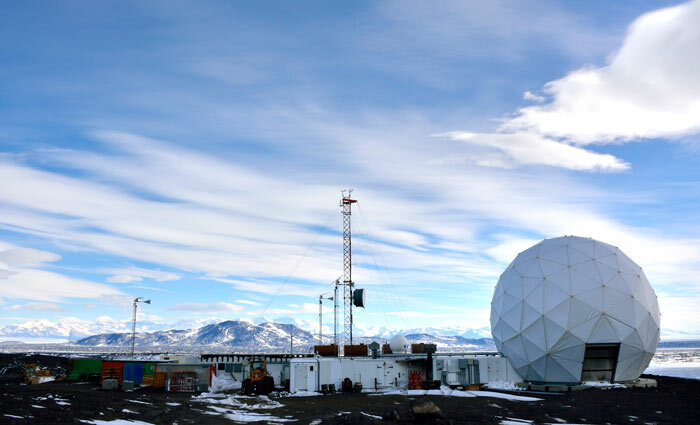 Accordingly, in 1984-85 the INMARSAT terminals, an HF receive facility, and a microwave link to McMurdo were relocated to Black Island, about 18 miles south of McMurdo as the skua flies...and officially commissioned in February 1985. 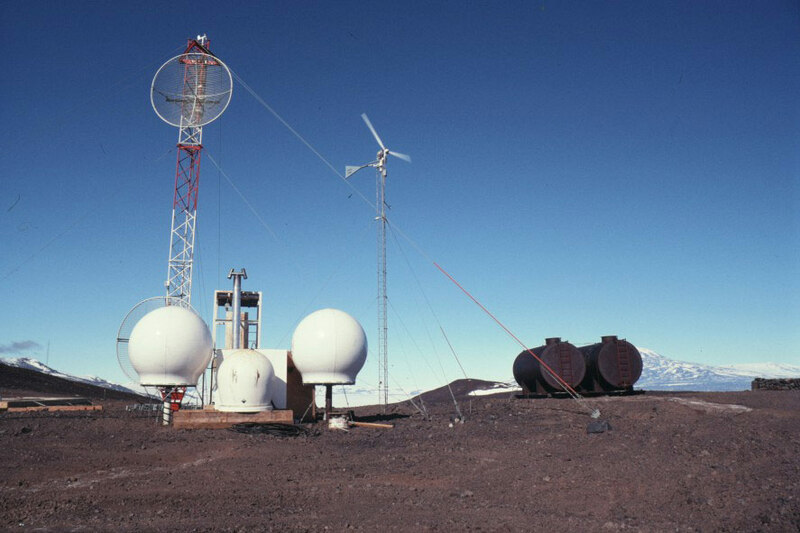 The Black Island facility also included other HF and VHF towers and systems, a 16' x 32' Jamesway shelter for temporary housing, fuel tanks, a 1200 watt ORMAT JP-8-fueled closed cycle vapor turbine generator, and a wind turbine and battery storage system. Concurrently with the Black Island installation, the SPSDL was also installed in 1984-85 to provide data communication between Pole and McMurdo using low earth orbit satellites. At right, a diagram of the SPSDL system...and also here is an article about the project from the October 1985 Antarctic Journal--both of these by NASA Mike Comberiate. 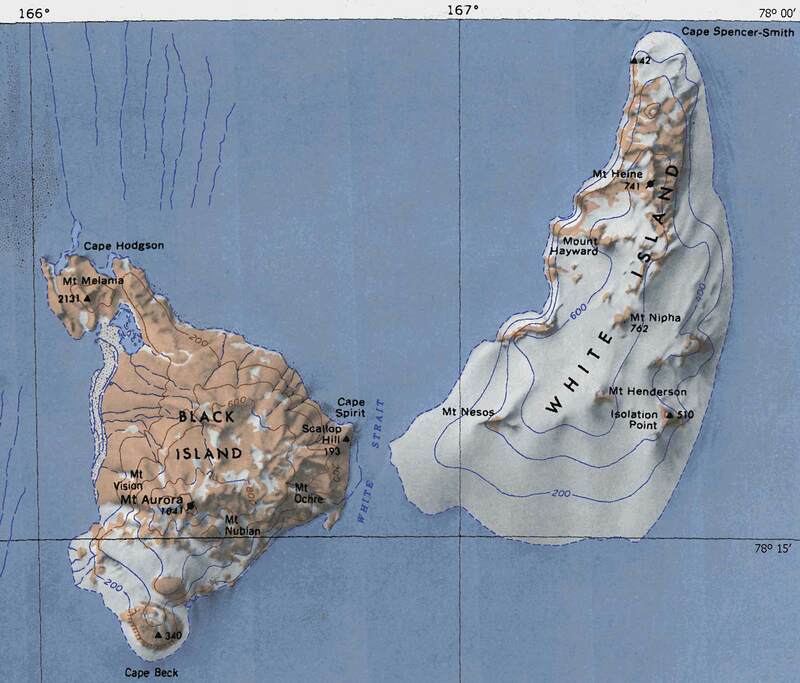 A map of Black Island and White Island. The site is near Mt. 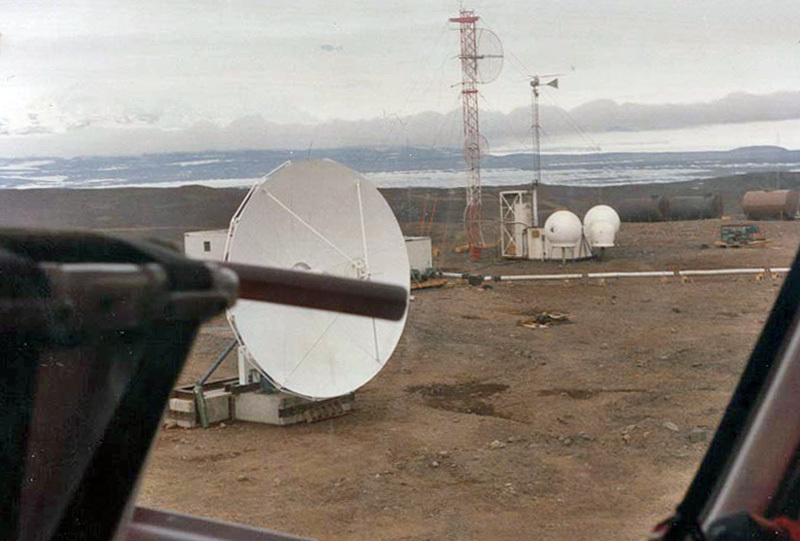 Melania on the north end of Black Island, 20 minutes by helicopter (or perhaps 2 days overland depending on weather) from McMurdo, which is about 15 miles north. Here is Darwin Smith aiming a 6-foot test antenna at the various satellites. What Darwin was looking at (successfully). These 2 photos are from NASA Mike Comberiate. The precast concrete foundations for the antenna and radome (to anchor them from high winds) arrived on the ship in January 1992. The antenna materials were flown in at the beginning of the 1992-93 season. The first INTELSAT antenna actually turned out to be a NASA surplus/decommissioned 7.2 meter VertexRSI C-band antenna provided by Satellite Transmission and Reception Specialists (STARS), a company which had previously provided transportable earth stations for other venues including the 1984 Olympic Games in Los Angeles and the 1985 Live Aid concert in London and Philadelphia. STARS was acquired by IDB Communications in 1992; that venture would disappear after further mergers with MCI, Worldcom...etc. 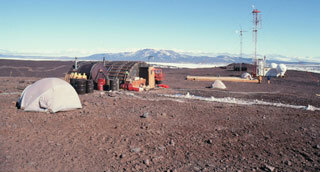 When the antenna foundation and pedestal was installed, a trench had to be jackhammered in front of the foundation (by Todd Liccketto) to accommodate the extremely low satellite look angle. 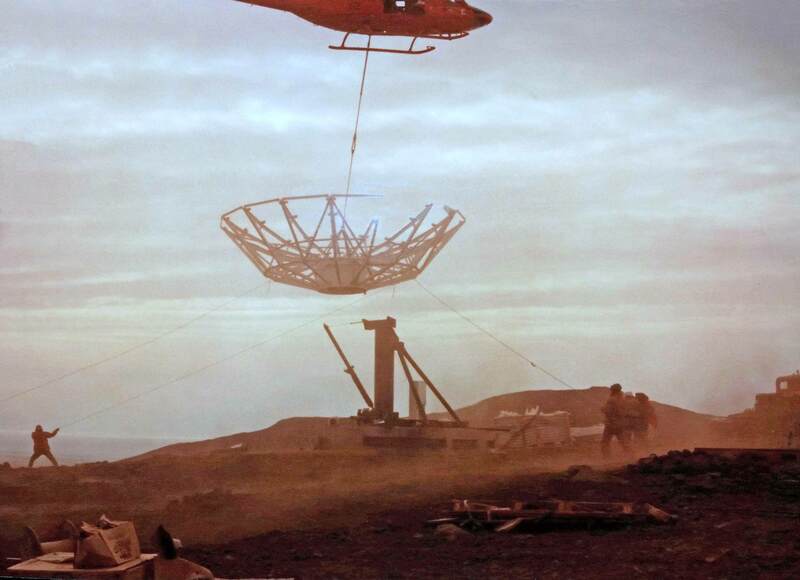 The first attempt to install the antenna dish structure onto the pedestal was by helicopter (as there was no crane) as seen in the rather dramatic photo at left. Unfortunately, that didn't work because the prop wash caused the dish to be too unstable to install the initial bull pins. So the crew had disassemble the structure and stick-build it in place from scaffold. is standing on the ladder installing the feed assembly. At left, another view of the INTELSAT antenna with the INMARSAT domes in the background. 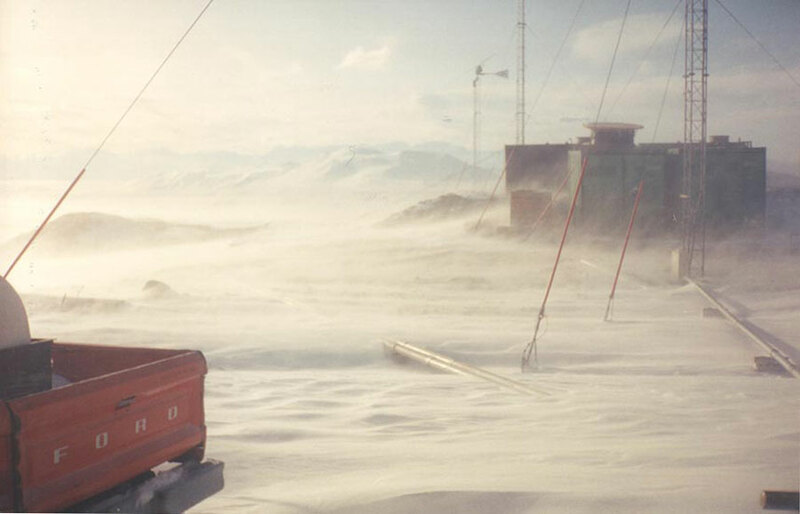 Todd took this photo from a helicopter while returning from a laundry/resupply trip to McMurdo. He described it as having a look angle from 3º above the horizon to...below the horizon. Due to the satellite losing station keeping abilities, not to mention Mt. Erebus, there only were comms for about 8 hours per day. lousy weather that the installation crew had to deal with. 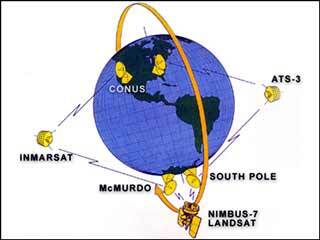 According to engineer Dennis Tupick (whom I'd worked with at ITT Antarctic Services in the late 1980s), completion and activation of the new satellite link was a frantic race against time...successful completion occurred only a few hours before a scheduled Good Morning America program which was broadcast on 25 November 1992 US time, the day before Thanksgiving (the upcoming broadcast was mentioned in this 23 November 1992 Washington Post article). And there was also an ABC Nightline interview broadcast late evening 24 November US time, where Chris Wallace and Michael Guillen interviewed Dave Bresnahan (Vanderbilt University information link and ABC News link). 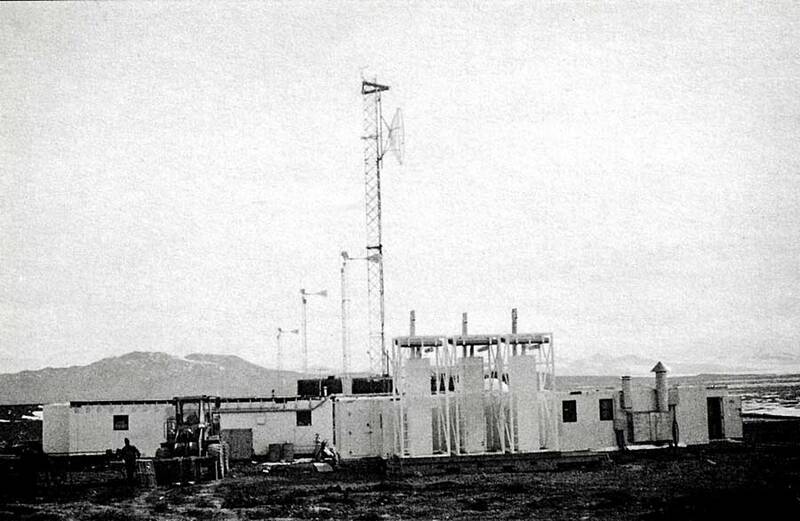 Concurrently, later in 1992-93, a new power plant was erected, which included three of the 1200-watt ORMAT generators, and the microwave antennas on the tower and analog radio system to carry the INMARSAT, HF receivers, phone, and remote telemetry for the station were upgraded to a digital system with much greater capacity for the new 768 kbs satellite link. At left above, an aerial photo of the earth station (NSF photo by Lynn Sumarski) from the 1993 Antarctic Journal review issue, which also indicated that the station was operating at 192 kb/sec. 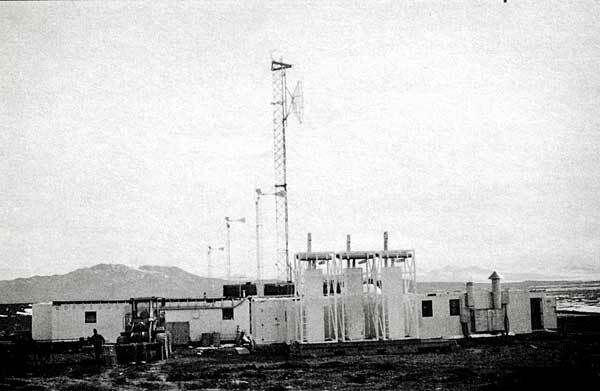 I'm unsure of the actual date of this photo...as one can see a radome as well as the 3 ORMAT generators. background. 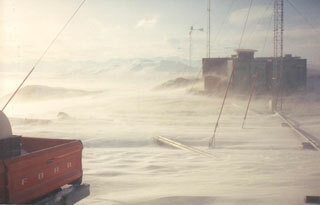 (NSF photo from the March 1994 Antarctic Journal). The antenna did not have a radome during that 1992-93 season. According to Todd Liccketto, they decommissioned (stowed) the antenna at the end of the summer season by lowering it to a "bird bath" position and removing all of the reflector panels to allow the winds to blow unimpeded through the structure. 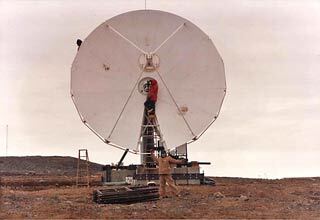 In 1993-94 the radome was fully erected and the antenna reflector panels were reinstalled, thus recommissioning the antenna for permanent use, as seen below. 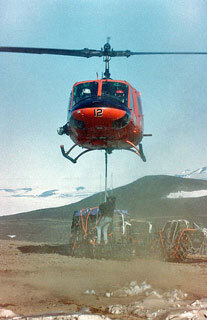 Delivering materials to the site by helicopter. 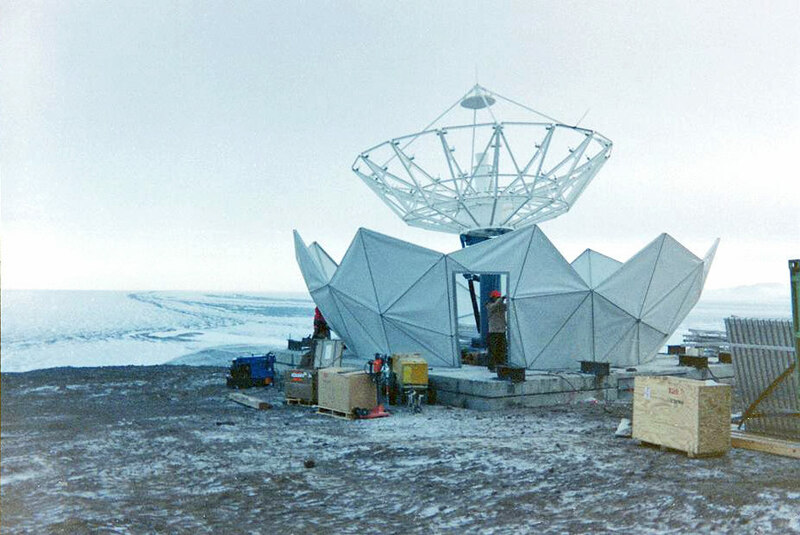 A view of the antenna, with the radome under construction, and before the reflector panels were reinstalled. These two photos are by David Knowles. Here's Todd's photo of the completed radome, with Mount Erebus in the background. Trivia...when Todd returned for his second season he privately brought a satellite video receiver...and was able to pick up AFRTS television signals...making Black Island a popular stop for helo pilots. 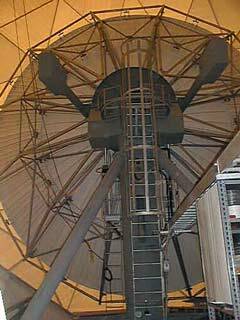 The next big upgrade occurred in 1994-95...when the original transportable antenna/radome system was supplanted by a more permanent 11-meter DAI (then a Rockville, MD company) C-band antenna in an 18-meter radome. This project was not without difficulties...the first radome blew away before it could be completed, so a replacement had to be flown in. At left...the back side of the new (and still in use) 11-meter antenna. This photo is by NASA Mike Comberiate. 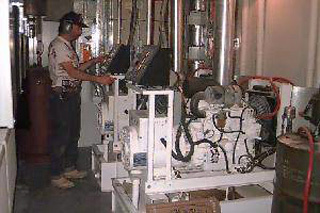 And in 1995-96, the three 1200-watt ORMAT generators were replaced with two 16 kilowatt diesel generators...as seen in Al Oxton's photo at right. The generators are being attended to by Jeff (we don't recall his last name). The above photo from Al Oxton is from his 1996 winter, but it is very similar to a smaller photo he emailed me in April 1995. Here's his description: looking roughly northwest from the slopes of Mt. Melania. At right of course is the new radome. Looking at about 8 o'clock from the radome is the equipment module for the communications hardware. 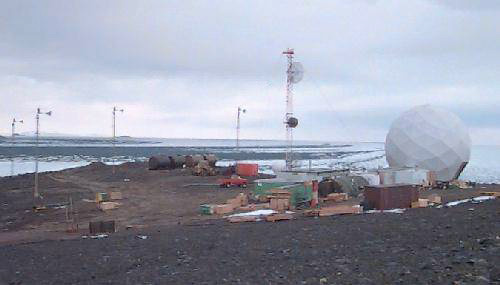 East of that is the generator shack, and next to that is a Jamesway for additional temporary summer housing. 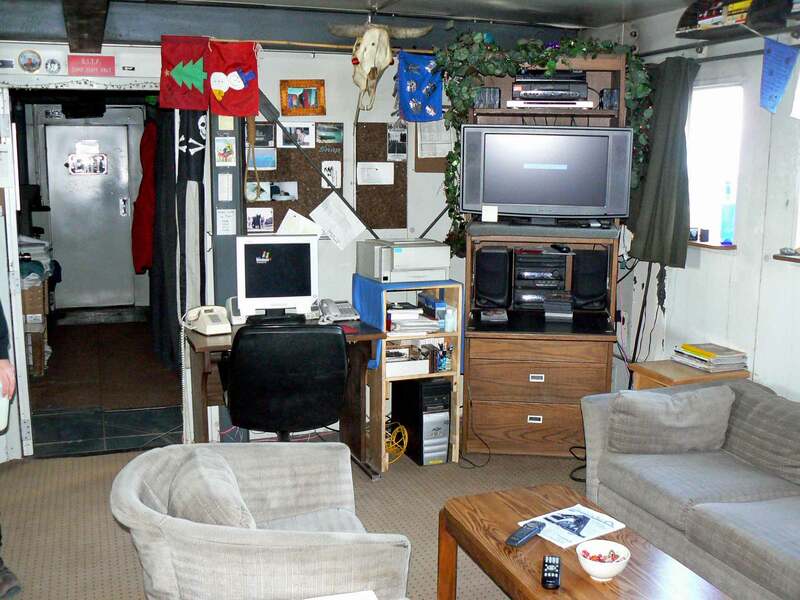 Between the Jamesway and the microwave tower is the personnel module, with a galley-lounge at the north end, a bunkroom to sleep eight at the south end and PV arrays on the roof. In front of all that...one of several storage milvans. Next to the microwave tower is one of the original small white INMARSAT domes for backup satellite phone communications. In the background behind the red pickup is the old generator shack, the first of the (now four) wind turbine towers, and the four fuel tanks, two relocated and two more recently delivered. Compare Al's photo with this one from 10 years later, taken on 4 February 2005 by Cleve Cleavelin (who wintered at Pole in 1997). This is from the USAP Photo Library (link to original). The Jamesway is gone, but otherwise the place looks about the same. As it does 9 years later in the photo at the top of this page. An undated indexed aerial site photo. A larger aerial photo of the site as seen from a servicing helicopter approaching from McMurdo. These two NSF images are from the RFI attachment (see the communications history reference below). 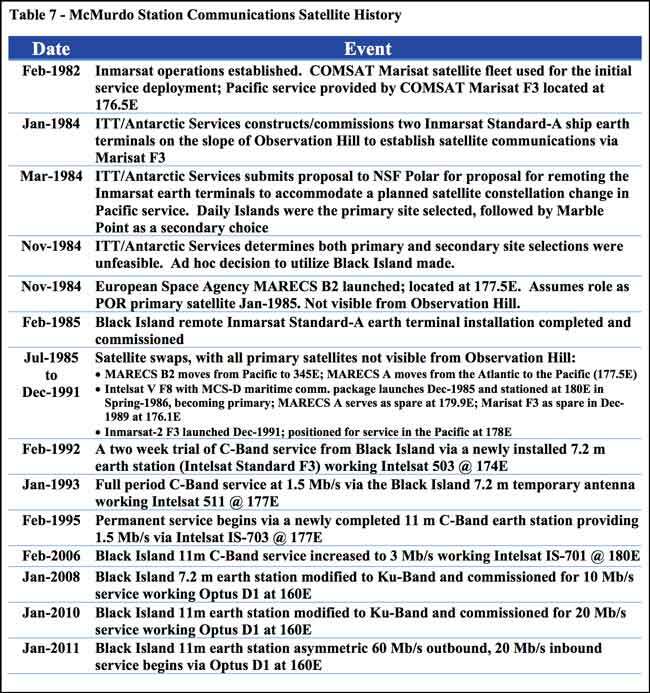 Below...a summary of McMurdo satellite communications history, which mostly involves Black Island. 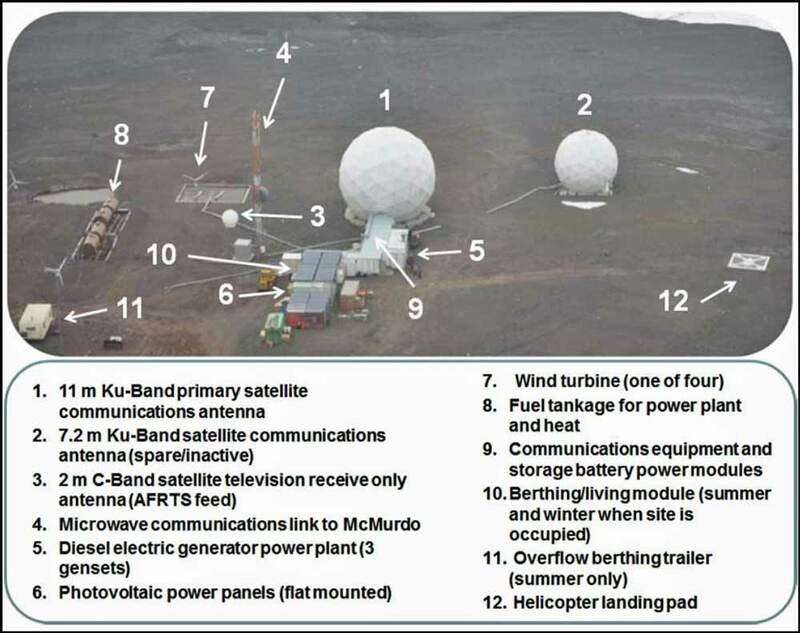 The above is from the NSF document "Attachment 1, United States Antarctic Program, McMurdo Station, Antarctica, Communications Needs Assessment", which was an attachment to this April 2015 RFI titled "Satellite Based Broadband Communications Services." One possible inaccuracy in the above document--the February 1992 "two week trial...via a...7.2 m earth station" may actually refer to the 6-foot portable antenna depicted above in tests conducted by Darwin Smith...after all, 7.2 meter portable antennas aren't that easy to obtain, ship, and install--and the VertexRSI/STARS antenna which actually was installed didn't show up until the 1992-93 season. 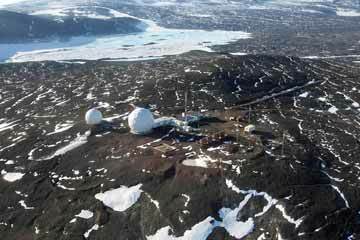 This May 2010 Antarctic Sun article details the 2009-10 and pending 2010-11 upgrades to the Black Island facility mentioned in the above document. These led to northbound data rates of 60 megabits per second. 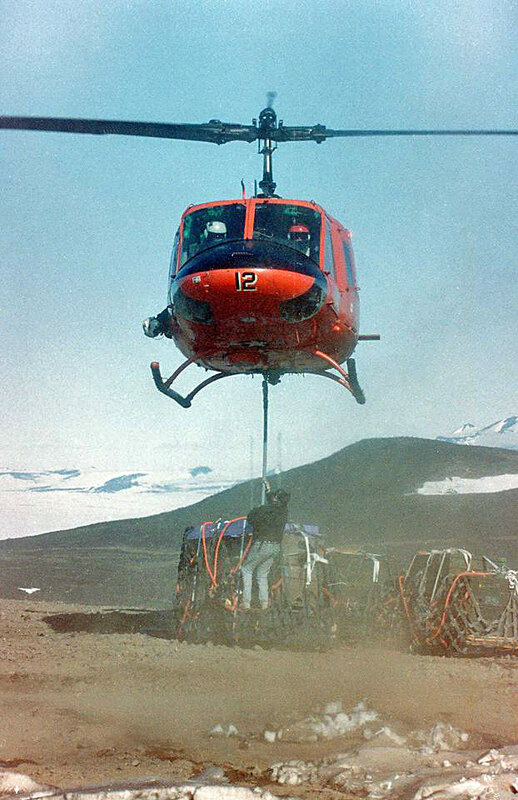 When I did research for this page, I was very surprised that my usual excellent pre-internet information sources--NSF's Antarctic Journal and the New Zealand Antarctic journal Antarctic, contained...almost nothing. Other than the various photo and other sources mentioned above, the first main source for this page turned out to be a collection of my old email exchanges with longtime good friend Al Oxton dating from 1990, as well as some of the newsletters from his 1988 McMurdo winter which he later published online. He also wintered at McM in 1994, 1995, and 1996. 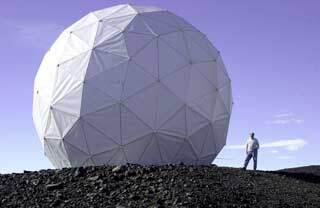 A continuing theme of his emails was about how he seemed to be spending LOTS of time at this supposedly unmanned earth station. 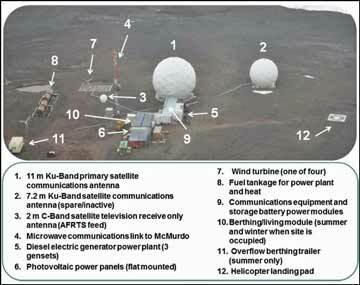 Later I obtained additional information from Dennis Tupick, who wintered at McMurdo in 1992 and was instrumental in the original earth station installation; Bob Jungk, another engineer intimately involved with the project; Todd Liccketto, who was the field engineer for the initial 1992-93 antenna installation (he returned for two further summers for proof-of-concept testing and full operational commissioning), and Tom Learned, who wintered in 1994 and worked on the foundation and radomes for the 11-meter antenna. 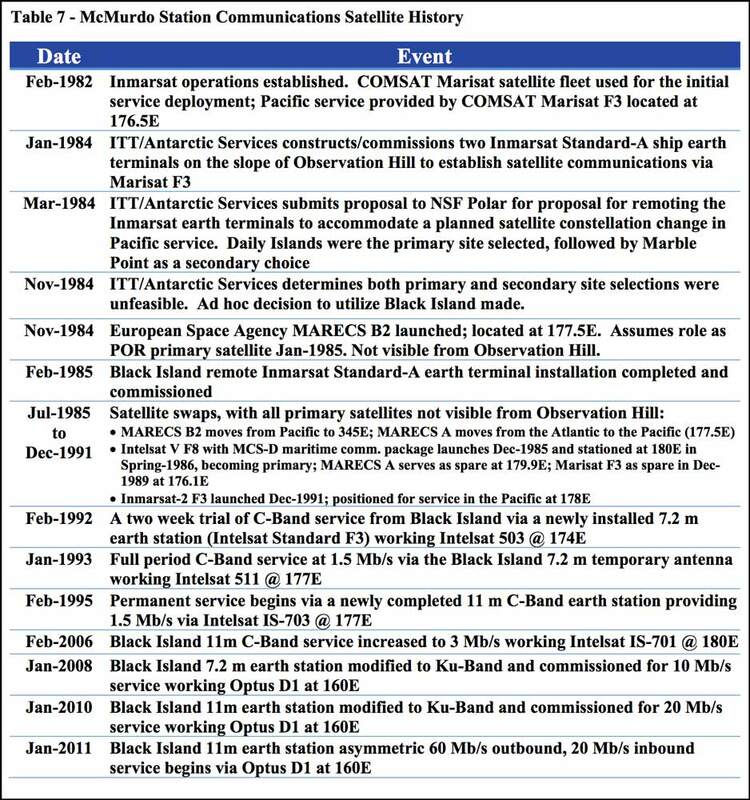 Other references for this page include several NSF EAM's: from 1 April 1991--The Black Island Telecommunications Facility Upgrade--the original document, proposing an 11-meter antenna, two additional ORMAT generators, and two additional fuel tanks (as well as moving the original 2 tanks); from 31 December 1991--upgrade details--addressing the planned 6.1 meter antenna construction as well as plans for 2 temporary diesel generators during construction; from 13 January 1992--addressing a proposed greywater system with an evaporation pond; and from 22 January 1993-- addressing the installation of the 11-meter permanent INTELSAT earth station installed in 1994-95 as seen above. 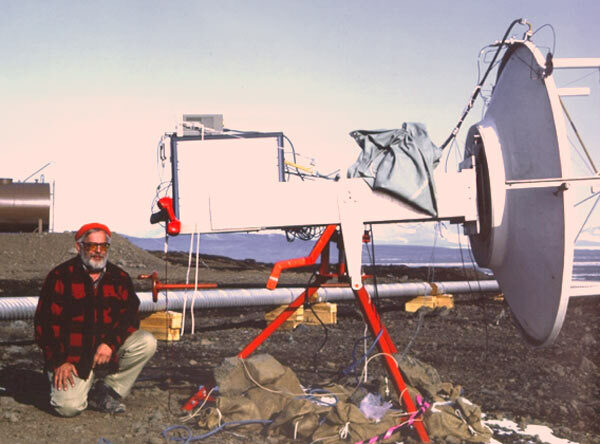 Also...the 1988 1:250,000 USGS map "Mount Discovery" available here, and this 2012 Quality Digest article which appears to describe a site inspection prior to the conversion of the two antennas to Ku-band service in 2008 and 2010. 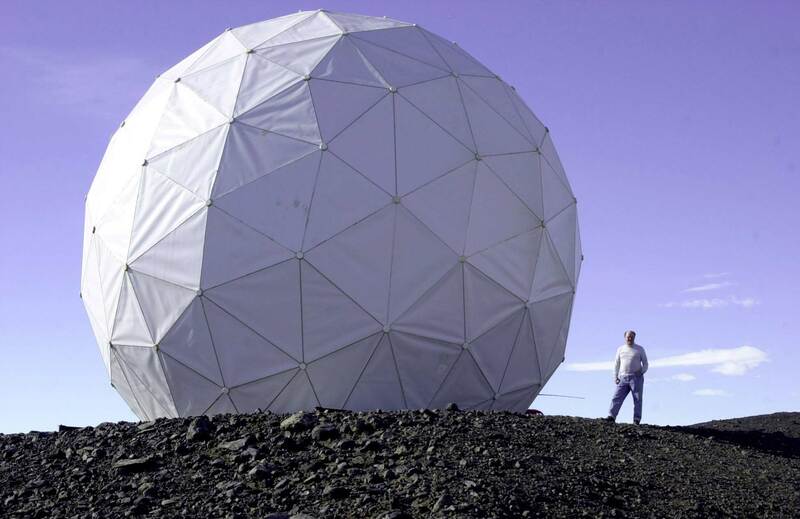 I should add that the current (June 2017) information I have is that the results of the recent referenced study indicate that the location for the new dish at McMurdo has been selected, either Observation Hill or Crater Hill/T-site. 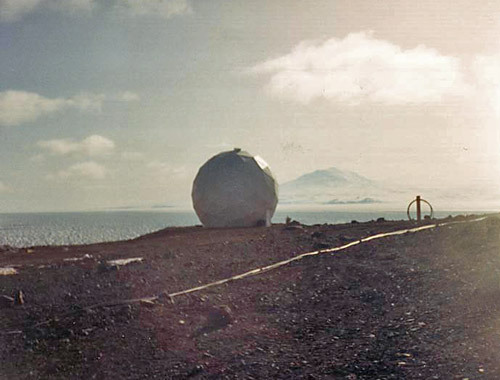 And I must sadly note that I first came across Garth Varcoe's 1989-90 photos of the original INMARSAT station while researching the October 1992 helicopter crash near Cape Royds, in which he and two others were killed.